Western Digital makes a damn good hard disk drive. The company's quality is legendary -- it is a popular choice for both home and the enterprise. I am currently testing one of the company's latest external offerings -- a 20TB monster aimed at home users and enthusiasts. But what about the enterprise? Don't worry, Western Digital is focused on business users too. In fact, today, it announces an enterprise hard disk drive with a massive 14TB of storage capacity! This is the largest capacity enterprise HDD ever, and follows its 12TB offering. Called "Ultrastar HS14," the helium-filled drive uses HGST (a subsidiary of WD) branding. This drive isn't just attractive because of its large capacity, however -- it is also very power efficient. "As data grows exponentially, storing it all in an affordable and accessible manner is an ongoing challenge for enterprise and cloud service data center operators. With a focus on total cost of ownership (TCO), the factors of capacity per rack, power consumption, cooling, maintenance, and acquisition cost are all paramount. 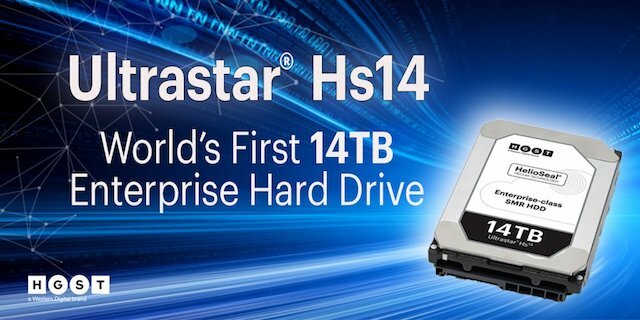 To combat the big data challenge, Ultrastar Hs14 drives deliver unprecedented capacity leadership and online watt/TB power efficiency for extremely low TCO by harnessing two core complementary technologies -- fourth generation HelioSeal technology, and second generation host-managed SMR -- along with enterprise-class reliability," says Western Digital. The famed company drive-maker also says, "These mature, field-proven technologies provide the foundation for delivering efficient, quality and reliable performance required by cloud and hyperscale environments, perfect for ultra-dense scale-out storage systems running sequential write workloads. 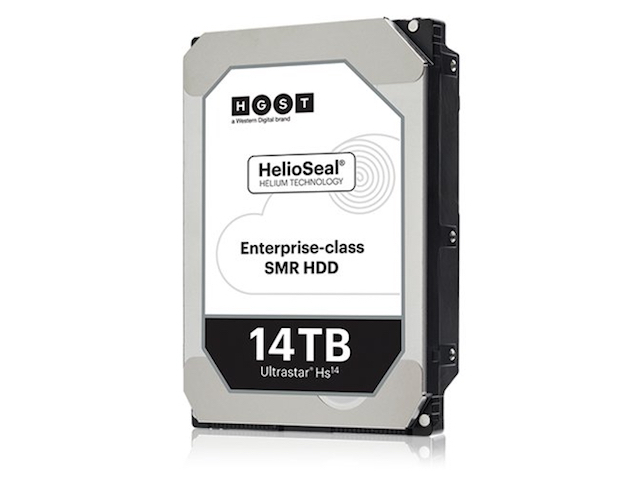 By utilizing SMR technology, Ultrastar Hs14 HDDs offer a 16 percent increase in capacity while keeping highly predictable, highly reliable performance." Western Digital highlights three major aspects of the Ultrastar Hs14 below. HelioSeal Technology: Western Digital's fourth-generation helium filled drive technology brings the highest capacity hard drive to market much sooner than competing offerings. Reliability: Amongst the industry's highest MTBF rating at 2.5M hours. Western Digital has really done its homework with the Ultrastar Hs14, as it features everything a business or data center would want from such a HDD these days -- capacity, power efficiency, and reliability. If anything does go wrong, however it comes with a 5-year warranty. If you want to buy this for your company, you will unfortunately have to wait. For now, both availability and pricing are unknown. Western Digital is merely sending out samples for now, which is reserved for high-volume partners.